This entry was posted in Video on September 25, 2017 by admin. This entry was posted in Video on June 17, 2016 by David Northmore. See how Quote Stream works in just 60 seconds by watching the video below. This entry was posted in Video on July 24, 2015 by David Northmore. Go here for full transcript. Please note that the transcript is not 100% perfect and will contain errors of spelling and grammar and just incorrect heard words. In this video, I’m going to show you Tall Emu’s Inbox 360, which is our Outlook integration with our CRM. What you’ll see straight away on the right-hand side, I’m running Outlook here. I’m running it as a use called “Jeff Vader”. This is just a set of test data, and I’m just going to show you through some of the features. On the right-hand side here, you can see what we call the “sidebar”, and the sidebar shows us data from within Tall Emu CRM instantly in Outlook. If I move between these two emails here, we’ll see any data that we have in CRM. The only one I’ve got data for is this Mike Nash record. If I look over here, I can see a few bits and pieces of information, so obviously, the person’s name, a little indicator to see whether or not they’re inside CRM, their phone number, which we can have click to call, their website address, which we can have clickable to go visit them, whether they’re elite or a customer. If they are a customer, what grade they are if you use customer grading, and when we first and last had contact with them as a business. We’re also showing whether … Which people in the business are working with this particular company. Then, down here, we start … Again, this is some more interesting data, so we can see the lifetime value of the customer, their current balance, do they have open quotes or sales orders, opportunities, support tickets, and we can drill into this data just by looking in here. We can see this particular client has a couple of open invoices overdue because it’s highlighted in orange. These are things that have been purchased recently, and you can see the overall sales chart for the last little while. In the Influence tab, we can see there’s a $5,000 opportunity called “Sales”, which is at the quotation stage. We can only see that Mike from Tall Emu referred as … To A-Z Stationary Supplies as a [00:02:00] customer. Moving along here, we can see any open tickets, so we have a ticket here. Trays are wet in the cafeteria. It was on the 24th of the 7, so it’s a brand new ticket. Last but not least, we see down here the communications that we’ve had, so these can be email communications, records of phones, meetings, tasks, but also things like visits to the website and web forms that have been filled in. The purpose of this sidebar really is to give the user of CRM immediate insight when there is even email from one of your clients. Straight away from here, I can see this customer owes me $500. I don’t have to go into my accounting system. I don’t have to go into my CRM system and hunt around for that data. It’s just really being put there right in front of my face. One other nice feature of this little sidebar aside from clicking to call is that you can actually hyperlink from here into CRM. For example, if I go into the Influence section, I’d exactly look at opportunities. I can click there. It will open up the opportunity from within CRM, so it does provide some fast access. That works with opportunities. It will work with these items here, so I can click here, and I’ll get the Mike and Mr. Stevens meeting, which is planned in CRM with Jeff Vader and myself. I can even go back, or I can get the email that I sent to Jeff just to set up really for this demo. Again, what this lets you do is you get an email from a customer, say, similar to this one that says, “Please call me as soon as you can,” and you’ll see when I open up the email, I see the sidebar as well. What’s nice is straight away, “Please call me as soon as you can,” I can have a look. I can see there’s an open opportunity, there is a support ticket. I can pop in there. I can see the trays are wet in [00:04:00] the cafeteria, there’s a $5,000 opportunity, guy owes me a few hundred dollars. Right away, I get like a little bit of insights into who this person is and what the current status of their relationship is. The other thing that our Inbox 360 does allow us to do is when we get an email like this, we can synchronize it to CRM. Now, we’re not going to synchronize all emails to CRM because you get an awful lot of noise. Even just trying to arrange a meeting, you may go through 5, 10, 15 emails backwards and forwards between people, “Is this time good? Is that time good?” We recommend that you synchronize emails more selectively to keep the signal-to-noise ratio in your CRM to the right level. We see here a Tall Emu menu has been added. I can click there, and what I can do is synchronize the email. That will grab this email with any attachments, and it will just copy it straight into the CRM. If I hit “Sync Email”, I get a little dialogue. It’s from Mike Nash at Tall Emu. It’s to Jeff Vader, and I can hit the “OK” button. Now, it’s asking me. 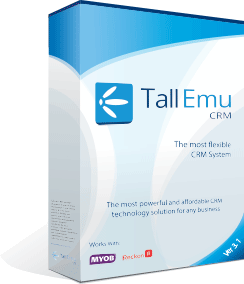 Do I want to associate “tallemu.com” with the company Tall Emu? You would usually want to say yes to that because that means that I don’t have to think about which particular company an email address belongs to. If it’s “tallemu.com”, it would associate it for a Gmail or a Hotmail. You would know. Just because of the way I’ve got my demo set up, I’m going to say no to that, so it will ask me every time. What just happened there, I don’t know whether you noticed, but there’s a little blinking flash. That just means the sync is done. It’s now inside the Tall Emu CRM database. If I wanted to, I could get rid of this email. You can only see here two more buttons. One is “Create Opportunity”. One is “Create Support Ticket”. These do pretty much what you would expect. If I create an opportunity from here, what it’s going to do is it will make a new opportunity record inside the CRM. It will look [00:06:00] for the Mike Nash record. It will try to find it by its email address. If the Mike Nash record doesn’t exist, it will create it. Once we have a Mike Nash record, it will then go and create the opportunity. Link it all up. It will copy the body of this email into the opportunity, and what it will then do is synchronize the email to that opportunity inside Tall Emu CRM all in one quick operation. The same sort of thing happens with a support ticket. You click “Create Support Ticket”, and straight away, boom, you’ve got a support ticket inside the CRM with everything attached to it. It’s just a very, very fast operation indeed. If I come back to my main menu inside Outlook, I can click on the tab. There’s a meeting here with Mike and Mr. Stevens. That’s actually synchronized out of Tall Emu CRM. I created a meeting in there earlier on, and what we want to do to synchronize our calendar, simply go to the menu, and we can click “Synchronize Contacts and Calendar”, and it will do it. Now, if you have this set up correctly, this will work from anywhere where you have an internet connection, so you’re not required to be in the office to perform the sync. Let’s say, for example, at 5:00 in the evening, we had a meeting, which was a personal meeting, so let’s make a new meeting inside Outlook, and let’s just say “Some Personal Meeting”. Maybe a doctor’s appointment or something like that. Maybe it’s happening in the middle of the day. It doesn’t really matter. What we can do is we can hit the privacy flag here inside Outlook. I’ll mark that as a private meeting, and I’ll hit the “Save and Close” button. Now, I have our meeting, which I synchronized in earlier from CRM, and I have my personal meeting down here. I’m going to hit the “Sync Contacts and Calendar” button. In the background [00:08:00], that’s going to start synchronizing with Tall Emu CRM. I’ll open up CRM in just a moment or two, and we’ll take a look at that. While we’re in Outlook still, I will also just quickly show you synchronization from the inbox. Before, what I did was I opened up an email, and I used the Tall Emu menu here to perform a sync. If I already know what the email is, I can grab the email, and I can hit “Sync” just there. It does exactly the same. But if I wanted to sync three or four emails, I could multi-select them, and I can click “Quick Sync Email”, and what that will do is that will just synchronize the email directly into Tall Emu. It’s not going to ask me any questions at all. It’s just going to do it, put them in there, create contacts, and the job was done. What I’ll do is I’ll just drag over the CRM. We can see the meeting with Mike and Mr. Stevens in the cafeteria, which matches up with Outlook. Down here, we see our private meeting. It just says “Private”. That’s it. Let’s move CRM back out of the way. We can also set a couple of options inside here. If I grab my Tall Emu menu, I can go here, “Options”, and there’s a few things that I can choose. I can choose how far back to sync my calendar. Normally, you only want to go back a month or so. It just speeds things up a little bit. I can do a one-way calendar sync, so only meetings created inside CRM will go to Outlook. Generally speaking, you don’t want to do that because you want the flexibility of creating meetings either on your smartphone or inside Outlook and having them sync. “Auto-Sync Calendar” pretty much does what [00:10:00] you would expect it to do, and you can set a time interval there. We can choose here where inside Outlook we want to save our meetings and our contacts. That’s if you have multiple contact folders, you can select which one is the most appropriate. One that I would generally recommend that we do once it’s turned on is use the one-way contact sync from CRM to Outlook because you want to have CRM being the main source of truth if you like and pushing data out to all of the Outlook devices. That’s really it for the basics of the Outlook plug-in. As a quick recap, we have the ability to synchronize our calendar. We can synchronize our contacts. We can view, put in data within Outlook, synchronize emails, create support tickets, and generally, get a real nice view of where we are simply by receiving an email. This entry was posted in Video on July 15, 2015 by David Northmore. Go here for full transcript or go here for the Question and Answer sections. Please note that the transcript is not 100% perfect and will contain errors of spelling and grammar and just incorrect heard words. Mike Nash: Yes, we do. Multi-location stock control. We can do stock control for bundles, we can do stock control across manufacturer’s items and we have a unique, or at least I think it’s unique, feature called a “virtual product”, which is basically, you have one product line where you hold stock, so let’s say, a cheap plastic mouse. You have two product lines that you sell, so let’s say, a PC mouse for five dollars and a Mac mouse for seventy nine ninety five. Both of those virtual stock codes draw from an underlying real stock code. Mike Nash: Oh, yes. Excuse me. Yes we do. What I’ll do is I’ll bring up that PowerPoint presentation and I’ll show you some screenshots. We have something called Inbox 360. Inbox 360. Once you’ve got this thing installed, you absolutely never want to be without it. I’ve received an email here from a fake individual, Jason at Wine Group. What’s happened is that as I received his message, this part here is part of Tall Emu CRM. It’s called Inbox 360 and it pulls the information out of the CRM, so his name. The little icon indicates he’s in CRM, his mugshot’s come out of CRM, I can click here to call him, it’ll dial in straight away, go to his website, there’s his email address and then we have a bit of a summary of our relationship with … Not with him personally, but with his organization. I can see here he’s a customer. He’s not been rated, his first contact with us was back in 2013, [00:22:00] his last contact was April of this year and who does he normally work with. Then we’ve got an overview of some of the financial summary and in that financial summary, we could quickly infer what’s going on. How much is he worth, what does he owe us, what [inaudible 00:22:14] are outstanding, what sales opportunities are. Down here, disturbingly, we’ve got twenty one customer service tickets that are open and two projects, but we don’t actually owe him any goods, so we get a relatively good handle on where we’re at just from this guy sending us an email. It means you don’t have to dart into the CRM and hunt around all our accounts. You’re just going to, in fact, dart around and try to find this data. I can go into the next screen and we’ll be able to see any open invoices here. We can click those invoices, they’ll open up automatically. Recent purchases will open the items and the sales chart, I think you can guess pretty much what that’s showing. Receiving the email as well, I can’t show it beyond this screen right now, but it’s possible to synchronize that email into CRM. It’s also possible to synchronize the content and the calendar with CRM as well, so that’ll synchronize out with your smartphone, also. Just while I’ve got the PowerPoint open, I’ll just show you the next couple of slides as well, then I can get rid of it. This little pop up here is what also pops up when the phone rings, so this thing here, we’ve tried to keep nice and consistent between the phone system pop up, the Outlook pop up and the mobile CRM, which we’ve just released for Apple, Android and Blackberry. Mobile CRM you can see just very briefly. Simplified screen, click company, you get a list of companies. You can use this to sort them by distance from your current location, so if you [00:24:00] turn up for a meeting, then you can’t have the meeting, you can click here and find other willing victims nearby that you could go and see. You can click inside, see the details in that same summary format, you could edit the details, create the details in here and the nicest thing of all for me is this little thing here, which I use extensively. Get driving directions, which will basically use the Google GPS and maps technology to go and give you driving directions from your current location to that client. Sorry about the slight digression there on the [Outlook 00:24:33], but I thought I’d just get those quickly out of the way as well. We have more questions there, Renee? Mike Nash: Yes, it can. We have a full built in report designer inside here, which is something like Crystal Reports. That’s more for the techies. You can go inside here, you can hit the designer and you’ve got full access to the database. It’s a normal Microsoft database. We can see over here all of the technical gobbledygook and fields and things like that. I personally don’t use this, myself. I let the guys stick with this stuff, but you are able to produce some nice reports. We’ve got a top twenty percent report, we’ve got sales base reports built in and of course, you can build your own. What I really prefer on the reporting side of things is our KPI reporting system. I don’t know, I just think this is a little piece of magic. If I go in here into KPI reports, I’ll do a new report and I’ll just do a basic one. This is designed for end users to use, but also, if you are technically savvy with databases, you can very, very easily expand this. Let me show you what I mean. I’ll call it the Reckon report. One of the things that we want to measure [00:26:00] is invoices, so if I have a little look here, I can [sort 00:26:04] number of invoices, amounts of invoices. What I’ll do is I’ll just open that up, look at the entire list and I’ll just filter it off by invoices. What I want is the amount of invoices. I meant to measure the amount of invoices over the last four years and I’m going to measure them on a monthly basis. I’ll save that. Now I can preview that report. It’s probably going to pop up on my left hand screen and then I’ll drag it over. Yep. There we go. I’m not sure, I didn’t quite time that, but I think within a few seconds, I’ve just produced a report which shows me monthly invoicing over the past four years. Actual value, prior value, so what we can do is we can measure this month to month, period to period. You see here we have a target value. It’s possible to go in there and configure that, so you can set … [Cleverly 00:27:03], let’s talk about invoices. If we’re talking about invoices, we probably want to have a budget, we probably want to have a target and we probably want to have a stretch target, but there’s nothing stopping me having a super stretch target and a super, super stretch target. The nice thing about this is I can go in and add another KPI. This time let’s say meetings, so number of meetings per type. Again, just so it’s consistent, I’ll say the last four years. We’ll measure it monthly and we’ll click save and close. Preview the report once again … Thinking about it [inaudible 00:27:44]. Ah. There it is. Drag it over here. Now, I can see we only put one meeting in there before and so it’s just showing that. [00:28:00] We can do that. We can see the different types of meetings and how many. If I want my report to be sent to me automatically, I’m logged in as system administrator, so I can [dial on 00:28:11] and send it from those days, 8:00 in the morning, pick my recipients from employees or all contacts. I can send that to Peter, let’s pretend he’s the sales manager, and that report will just go now automatically. I can open up again and I’ll just show you by browsing all of the different KPIs. Here, we’ve got the number of calls per contact, the number of incoming calls, held calls, calls per status. In a CRM system, you might have a phone call come in and then you have a status of the call, so was the call answered? What type of call is it? Is it a customer service call? Is it an accounts call? is it a complaint? Then you can have a sub-type, so let’s say you do an outbound telemarketing call. This is the outcome of that call. Could be you left a voicemail, you couldn’t get through, it was the wrong number, he told you to go away. We can [00:29:04] all of these results here in these reports and everything inside here, with a little bit of training, you can set the targets on. You can see we’ve got calls, company creation, invoices, meetings and where we’ve got number and amounts and things like that, we can change the duration, we can change the frequency, we can change the type of measurements even underneath. We can say … Do we want to show tri-values, do we want to show quantities, totals, averages … You can set the targets based on your worst month, your best month, your average month all across these reports and completely automate them. The nice thing is we’re doing all of that, say, by sales territory, by salesperson. You can generate a set of reports for the owner of the business [gets 00:29:50] and then you can generate individual reports for the salespeople, so they can have their excuses ready for the sales meeting. Mike Nash: Yes. Funnily enough, we use our own software every day and we sell subscription software. Now, in an accounting system and I think Reckon does this as well, you can have a remembered transaction that pops up and says, “Hey, do you want to send this invoice?” We have a proper subscription system … No offense, Renee … where you can define … I should be careful what I say. You can define a subscription, you can set it to be in monthly, quarterly, six monthly, annually, it will generate you the invoice, it will optionally approve the invoice, it will optionally send the invoice by email. We also will let you chase up the invoice automatically as well, but using either EziDebit or eWay, we can also take the money, which is, of course, the best part of sending somebody an invoice. You’re able to sign up with a direct debit agreement with the client and have the CRM just grab that money out of the bank account or also, a credit card. In both of those cases, we’re not storing the credit cards or bank details directly inside the CRM. We’re working with the two partners, eWay and EziDebit, because they have super duper secured PCI compliant, all of that sort of stuff, data [censors 00:31:41], so they can protect that, meaning you don’t have the hassle of doing it yourself. Mike Nash: [00:32:00] Yes, absolutely it can. Pretty much unlimited levels of customization. I would normally do it in a demo, so if you rung up and had a demo with me and you started talking about your business, I would probably demonstrate that for you. I mean, let’s have a little go now, if you like. I did before a couple of customizations per person. If I were to go, say, to the product record, what I could do on here, I’ll just create a custom field. I’m waiting for that to pop up … Add a custom field and I’ll just say, for example, “Is Reckon Compatible”. I’ll make that a tick box and then I have a little custom field that I can tick on on there. Now that’s just a custom field. One of the other things that we can do is we can make whole structured systems. Just before I restart, earlier on, we did actually make a whole array of custom fields on the contacts, so what I’ll quickly do is I’ll just show you those and “Likes Kittens”, “Date Liked Kittens Since”. I can grab all of those people, right click, update fields, “Likes Kittens”. Everybody likes kittens and apparently, Renee. [inaudible 00:33:48] the date liked since and I can put in the kitten name. Now with that, I would call that, adding those custom fields … Now that’s almost a party trick [00:34:00] level of customization. Well, in actual fact, the CRM is made, funnily enough, using the CRM. I’ll just restart that and then we’ll do a slightly nicer example of the customization. Mike Nash: Oh, right. PDFs. Sorry. We could. We don’t do that out of the box, actually, with PDFs, but we could. There’s no reason why we wouldn’t be able to do that. With a PDF document, if you’re talking about documents that have predefined fields, we could write a little bit of extra code to do that as a customization and what we could do is we could have the person send them to a managed mailbox. I can add a mailbox and I’ll choose to pick the [inaudible 00:35:04] one. I can say get it via POP3 using this port using these credentials and then once you have it, run this workflow process. Inside the workflow process, we could write some code, just strip the data out of the PDF and pop that into CRM, so that could certainly be done. In terms of leaping back to its customization, one of the things that we can do, we link with Reckon, we link with Campaign Monitor, we link with other unmentionable systems from competitors as well. We can also link with your third party systems that you have. The whole system is designed to be integrated into a business process, so even if you’ve got a website with a hand rolled shopping cart on there that you really need us to link to, then we can make that happen for you as [00:36:00] well. Let me just show you a customization. What I’m going to again do is at this time I’m going to add a [inaudible 00:36:07] and let’s say … For the sake of argument, let’s pretend we’re a finance company and what we really care about is the number of mortgages that somebody has. I’ll make this thing called a “Mortgage”. I won’t do this very, very cleanly because I don’t want to bore everybody to death, I just want to show you that it can be done. Mike Nash: Yes, you may. We’ve got some very, very powerful importing and exporting facilities. Just before I leap into showing the results of that customization, here we’ve got full name, company type, company phone. If I bring up my field chooser, I can add, say, a website to that and what I can do now is right click and somewhere down here, I [can go 00:41:19] prepare a import. If I save that into my demo stuff folder, it saves a CSV file for me. If I go and have a look in that folder now, there are the fields, so this gives me a template CSV that I could fill in with the details. The reason why we do that is because if I were to go and import and grab that CSV file, I have to [00:42:00] go through this little wizard and [map 00:42:01] everything and show where it should go inside the CRM, which is quite silly because CRM already knows where it goes. What we’re doing here is we basically say, do the import, grab this file, use those rules and then it’s done the thinking for me. Then I can go ahead and import it [inaudible 00:42:21] data in that file and we can run those imports here through the user interface like that or alternatively, we can actually automate them. If you’ve got files getting dropped into a directory, we can do that, too. Unlike a normal importer, if you got this horrible Excel file that’s got companies and contacts and notes all mixed up, we can actually make that work for you. We can import a company and a contact and a note at the same time. It’s smart enough to figure out, okay, well this the third time Tall Emu’s been referenced, Tall Emu must take this, we’ll link this contact up to it. What I’ll just real quickly do now, I’ll go back to my customization, I’ll grab Melissa the cat hater and let’s give her a really big mortgage. I can go in here, right click, New, I’ll pick a bank. I’ll just use a companies for banks, so I’ll just use WLJ Real Estate. Melissa’s holding it and she’s a kitten hater, so she can have a five million dollar mortgage. I could go and grab somebody else, David, and I’ll give him … I can’t remember which one. Did I use the real estate one? I’ll give him … I won’t bother with the addresses. Now we can see, you can have more than one mortgage per person. One thing is, this looks a bit silly at the moment because you [forgot 00:43:43] balance and address, so because it’s a standard grid, I can grab my field chooser and I can put in the person’s name, the bank name. I’ll probably do it in that order. Bank balance, I’ll get rid of address because we’re not bothered filling it in, so then we end up like that. [00:44:00] I can save that layout and make it not look rubbish. Save it as a different one. I’ll just save over at the top. If I now go and look in the WJ Real Estate one, again, I’ve got my mortgage tab cross referenced and I can see I’ve got David and Melissa the cat hater both with mortgages with WLJ Real Estate. If I really wanted to, I could go inside here and I could expand this to have a mortgage related to a property with the property having a value, multiple mortgages against the property. You could just go completely bananas with it. The main thing is with the system is it allows us to record all of that data in a structured way that makes sense for you, so you’re not [printing 00:44:48] it all into notes. Many years ago before we had our CRM, I went to see a client and they’d spent some silly amount of money getting a six hundred page web based questionnaire developed and it was a questionnaire targeted at women and their financial health. They’d ask how old are you, are you married, do you have [super 00:45:12], what property do you own and five hundred and ninety four other questions, which they’d gather up and give to this company. Except they only had four custom fields in their CRM, so they ended up just attaching it as a Word document, which made the whole exercise really pointless because if you’ve got that sort of data, what you really want to do is find twenty five year old single women, eighteen to thirty, within the Sydney area and then go and sell them [inaudible 00:45:37] or something like that. This is the sort of thing that our customization really lets us do. It lets us make sure we get our data as exactly how we need it for the business. Hopefully that answers the customization questions. Any more questions pop in? Mike Nash: Yes. We’ve got Apple, Android and additionally, Blackberry and if anybody ever [asked for 00:46:10] a Windows phone, it would probably take us a week to finish that off, but no one’s asked us for that just as yet. We also have a web based CRM, which is really, really awful and ugly and basic, so never ever use it, but it is useful in certain situations because it does let us have companies’ contacts and activities. We can also synchronize the CRM to your laptop to give you an offline mode and we can also work with web forms on your website, which isn’t quite what you asked, but I’m going to show you anyway because it’s quite interesting. Basically, if you look at any website, you’ve usually got a contact form, contact us, fill this in and then we’re going to start spamming you. We have precisely the same sort of thing, so I’ve made earlier a “Contact Us” sample form. When I bring that form up on my screen, I give it a name. I tell it that when this form’s filled in, I’d like it to make an opportunity inside CRM and when I do so, I’d like this to be the default [foundings 00:47:15]. I’d like it to be called “New Lead From Web”. The sales type is [inaudible 00:47:21] sales, the stage will be “inquiry”, start date … I should clear that and set today’s date, the source will be website and I’d like it to be assigned to Sue. Assuming that the form is filled in correctly, I would like it to redirect to this particular Thank You page. Normally you fill a form in, you hit the submit button and then it flicks you off to a page that says “Thank you for filling in our form. We will start hassling you very soon.” That’s where you define the page on your website here. The error page, when something goes wrong, goes in there. In actual fact, usually if something has gone wrong, [00:48:00] you’re never really going to see that page because it has to go really quite catastrophically wrong. It normally would be that your internet connection’s not working, so you’re not going to see the page anyway. What I can then do is I can grab these fields, first name, last name, primary name. Even if you’ve added custom fields on there, I can use those fields as well, so I should be able to, for example, add a new field. I won’t actually go all the way through, but I should be able to find here … “Likes Kittens”, which is a custom field we made earlier on. I can add that, which I won’t bother doing. I can save that to file and give that to my web designer. What it basically does is it brings us a little page that looks like this and you can fill in these details. You give this to your web designer and you say, “Take that horror, make it look pretty, style it up and put it on the website.” What you can then do is they fill this in, it’ll run, it’ll punch the data into your CRM, it’ll flick the users to the Thank You page and then optionally, you can run what we call a workflow. The workflow is an automated sequence of tasks that we do, so it could be send the person an email saying we’ll be in contact soon, create the [inaudible 00:49:22] and account in Reckon, email the credit manager and ask the credit manager to assign them a credit limit. PDF a brochure based on a Word template and email that to them showing retail pricing only. Wait five minutes and then do it all. Here’s how we do it. I create a new rule and I say “when a” click, so let’s say, for example, quote. When a quote is created or updated … Let’s say, updated. We change the field status when the quote meets the following criteria, so if I leave criteria blank, it happens every single time that somebody updates a quote and changes the status or I can click here and I can add a filter. Here’s all of the fields that we have on the quote, so let’s say, total amount x tax greater than five hundred bucks. I can run a workflow which is complicated. It’s like Visio on steroids. It lets us do a nice techie flowchart and have automated stuff happen or I can use a simple notify, I can pick any employee or anyone who’s related to the quote, such as, say, the assigned to, [00:52:00] notify them by email, fax, SMS, so let’s say, email, using this template. I’ll pick that template and away we go. Done. We can do that across every single part of system. Every company contact, note, past meeting, anything that’s in there, even mortgage. I can do it when a mortgage is updated and the value of the mortgage is over half a million dollars do this. If I were to very quickly … I just realized I haven’t actually showed you quoting, so I should probably address that in my last four or five minutes. I can add a quote, I can pick my customer, pick the person I’m sending it to, I can add items, so this is pulling from the item list, have some tea, pop in a comment … Along here, what this is showing me is my stock, so I’ve ordered one, I’ve got eighteen in stock at my current location and eighteen in stock across all locations. If I was selling that from Brisbane, say, and I don’t have any in Brisbane, that’ll be [blue 00:53:23], eighteen’s in brackets. If I try to order twenty, it goes red. I don’t have enough. I can preview my quote and bear in mind, the quote screen can be all tailored to suit your needs as well as can product. Here’s my quote. That’s what it looks like out of the box and there’s a full quote designer inside here. It’s for the [inaudible 00:53:47] designer. You can customize that to your heart’s content. You can have as many examples and any types of that to your heart’s content. I’m just going to set that price to five hundred bucks, [00:54:00] press save. What I can do as well is I can actually send the quote from here and we’ll see a log in communications. If I were to go and change the status of that quote and save … There. Hopefully, what we’ll see in just a moment is an email getting sent because we set the rule “Quote Request Approval”. I can take that quote all the way through to a sales order. From the sales order, I can arrange a shipment of the goods. I can attach documentation, I can raise purchase orders, I can raise a project, so if you are selling services, you sell the service and then you have to do the service, we can create a project from here that will create tasks based on the services that you’ve sold, but I’m going to go straight to the fun bit and do the generation of the invoice. What’s the purchase order number? There we go. We’ll have a crack at that, generate the invoice. Now, it’s automatically approved, we can turn on invoice approval, I can send the invoice in just the same way as I can before, but this is the fun part, I can hit that button and it goes straight across to Reckon. Even though this customer might not exist in Reckon, the product might not exist in Reckon, the invoice might not exist in Reckon, pushing that button is a one shot. Transfer the invoice, all associated products, company contact, anything we need to, across to Reckon to make this a valid entry in the accounting system. We can do the same thing with payments, so if I made a payment on here, [00:56:00] received payment, I can log a cash payment, I can physically charge right now a credit card using eWay. We’ll take the money, we’ll get the receipt and we’ll transfer all of that across into Reckon, so everything’s all nice and compliant. I think, judging by the time, I should probably [pause it 00:56:25] about there. I’ll do one last request for any questions. Mike Nash: I’ve been asked about scanning business cards four times this week, so the answer is unfortunately, for the moment, you have to type them in. I will be looking probably next week at business card scanners. Mike Nash: The mobile app works with iPads. The main application itself doesn’t. Mike Nash: That is a good question. It works with the premier and enterprise versions of the desktop Reckon, so hosted Reckon unfortunately is a no go at the moment and Reckon 1 is a no go at the moment because neither of those products have an interface that we can talk to at this point. Although, the techies at Reckon do assure me that that’s being worked on. NOTE: Since time of publication this information has changed. 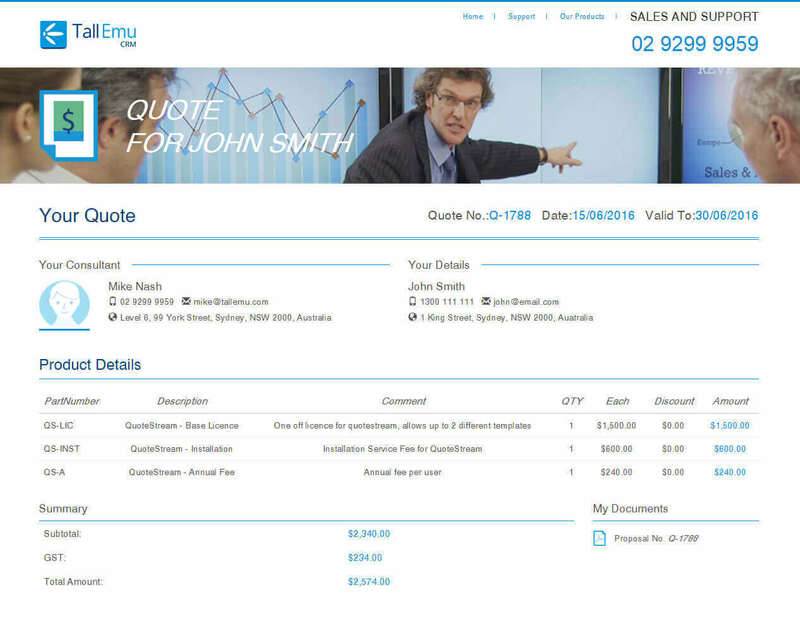 Tall Emu Web CRM supports Reckon One, and Reckon Accounts Hosted is being added. This entry was posted in Video on May 3, 2014 by Mike Nash. I’m going to give you a quick demonstration of Tall Emu’s mobile CRM. Tall Emu mobile CRM is available for Android, iPhone and BlackBerry devices including the BlackBerry Classic and BlackBerry Z10. Once you have the app on your phone it’s available from all of the app stores and you get it in the standard way. What you need to do is go in and set it up. We’ll tap on the app and it will load. Once the app’s loaded what we need to do is punch in what we call our organization code and organization key which is accessible in Tall Emu CRM setting. We punch these two values in and hit check license. Apologies for the black squares that are popping up it’s one of the small problems that we just have with the emulator but hopefully it’ll be enough to give you and idea of how this works. What the organization key does is that it identifies your company so that the mobile CRM knows where to go in order to get it’s data because all of our data access is done in real time. That’s quite handy for security purposes, it means if you lose the phone you don’t lose your data and it also means that your CRM also has the most up-to-date information in it. On the main menu here we can see companies, contacts, activities, notes and tasks and again, sorry for the black squares, it’s quite annoying. If I click on company we can see a list companies, I can scroll up and down them, I can tap in here which will bring up the ability to filter. Of course T a’s appears in lots of company names, I’ll shall find this one Tall Emu, click it, open it up. [00:02:00]. Once we have the company opened up we can see that we’ve actually got a view that’s very similar to Inbox 360. We’ve got the company name, we got the phone number, if there’s an email defined against the company we’ll show you that. We can see whether there is customer, the customer grade, how long and who’s been talking to them and again we get this really nice summary of the relationship with the organization so we can see the balance, what they owe us, the lifetime value, do we have opportunities open or tickets open. Again just like Inbox 360 we can tap through to these other areas, we can take a look so we’ve got outstanding invoices, recent purchases, then sales history over time. Navigating through I can see that there’s a $5,000 quotation opportunity. I can see that somebody has referred A-Z Stationery Supplies. In the tickets area I can see tickets, trays were in the cafeteria and I can also see a record of activity. I can get their web address and I can see and search for contacts within the organization. If I want to I can edit this, change those details, hit the save button and we’re good as gold. I can go back to my main menu. I’ll clear away that filter and along the top you can see that we’ve got another couple of icons. The plus icon will add another company, the filter icon will bring up a list of filters so contacted in the last seven days or something like that, we can choose our filter, we’ve got nobody that meets that criteria. I’ll turn off the filter again and now we get everything. One thing that’s rather nice is we can use this filter here, the little map pin to sort by their distance away from us. What we have inside the CRM is we know where all of the suburbs and states and addresses are and so [00:04:00] based on where the phone is and I’ve defaulted this to Tall Emu’s Sydney address, we can then turn that on and off too to sort and filter in that fashion. I can go back and I can look at contacts, contacts exactly the same sort of capability. I can go to activities, I can see activities last week, I can see activities today. Earlier on I did a demonstration of Inbox 360 and we had a private meeting. I also have another meeting here and earlier on this week there was a phone call regarding trays in the cafeteria. I’m able to click there, look at the details of it, if there’s a description I can see it. I can go back, I could look at this meeting here with Tall Emu. What’s quite nice is I can open up that Tall Emu record and assuming that we have the address inside here, I can actually get the driving directions as well. They’ll be a button that appears just about there which would give us the driving directions using Google Maps. Unfortunately because this is a simulator Google Maps isn’t available so I can’t actually demonstrate that feature. Roughly speaking if I wanted to add a new activity I can hit the plus button, I can fill in the details, search by company, pop in a description, hit my save button. All of this goes back live, real time into Tall Emu CRM. I will head back to my main menu, it’s still unfortunately occluded by that black square but we have companies, contacts, tasks, activities, notes. We’re currently working on an update which also extends this to include opportunities, management reports and things like that all available from the main device. If I go back to my main menu again and go into my settings window I can see here my settings for the [00:06:00] organization key and code that identify the company. The real time location tracking uses the GPS to track where the phone is so you’re able go and know exactly where your handsets are at all times while the CRM’s in use. Every time you log an activity that get time stamped as well as, as well as GPS stamped. I think that’s really it from my fast run through of the mobile CRM. There’s no cost to this application if you’re an existing Tall Emu customer. Every license that you have you’re automatically entitled to a license for a Tall Emu mobile CRM provided that you’re all up-to-date with your subscriptions and so on. If you’d like to get the application and you’re an existing customer just contact the help desk. If you are a new customer just contact sales. Thanks for your time. In this video, we’re going to have a quick look at basic CRM navigation. When you log in to [inaudible 00:00:06] in CRM, you’ll see something like the tabs along the top. We’ve tried to organize in a logical way and make it very, very easy and fast for you to access your data. In the Company tab, we see a list of companies and a list of things that you can do to companies. In the Contact tab, we see a list of contacts and the list of things that you can do to contacts, and so on with Activities, Products, Projects. I’ll stick in the Company tab for the moment. What we find here is our grid. If I wanted to open up a customer, I can double click their record, it will open, and now we can see the customer detail. Along the top, we’ve got basic customer detail, we have addresses, we have conversations, which are groups of activities along a particular topic, which could be a sales opportunity, a support, or customer service issue, or a project. We have a list of contacts at the organization, any projects that we’re currently working on. Our selling area shows us all of the selling rules, special prices, quotes, invoices, and so on. We have a location map and we have opportunities, asset management, [dash slips 00:01:24], which are little mini charts that show us sales and invoicing information for this customer. There’s not huge amount of data in here. This has just come from the test at MYOB. In the accounts area, we’ve got some financial facilities. Down here, we’re just showing the cross link that we have with MYOB. If we change any of this, for example, let’s just decrease the credit limit, it would then be possible to send that across to MYOB or whatever accounting system you use that we support. Save and close will save the record. That’s really the basic navigation. All of the other screens in the system work [00:02:00] the same way. If I go into Contact, here’s a list of contacts. If I want to open the Contact, I double click it, and all of the details are displayed. I can just click the X button to get rid of it. The same happens really everywhere else in the system. If I jump back into the Customer again, these are the buttons that also show what can be done to a company or with a company. For example, if I wanted to record an activity note, I can hit Add Note. I can save and close, and now we have an activity recorded. Just down at the bottom, I’m currently logged in as Peter Parker and I can see this activity note down there at the bottom. The same happens with Communications, Documents, Web forms. So far I had the document that I wish to attach to this company. I can right click At File, pull something in, and that’s now linked to this company where everybody can see it. We’ve tried to make the navigation as simple as we possibly can. If we wanted to see, for example, things related to selling, we’d click on the Selling Module, here’s the list of products. If we wanted to see invoices, here’s the list of invoices. It follows all the way through that, say, a list of data, which we can sort and you’ll see more information about that in the grid demonstration video, but we can sort and filter these things and we’re able to double click and open, and you have the records. When we go into a customer, we can take a look, we see a list of contacts. Again, this grid works the same way. It’s quite easy for me to go and just add a new contact [00:04:00]. Now, this company has got 2 contacts. In this video we quickly cover MYOB link with CRM. Our MYOB link deeply connects these systems, and allows you to manage your sales process in CRM completely transferring to MYOB either at the Sales Order,Invoice or Payment stage depending on your business needs. You may notice that there’s a lot of clicking in this video – it’s showing the system running completely manually. It’s possible to automate data transfer to or from MYOB based on your own business needs. For example – if you’re running payments in MYOB, you can schedule CRM to automatically import these payments several times per day. If you want to export clients automatically as soon as a sale is generated this can also be done. In this video, I’m going to demonstrate installing a Tall Emu CRM. I’m going to demonstrate connecting CRM up to MYOB and pulling in the data of MYOB and, generally, just showing how CRM and MYOB interact and just how easy it can be starting off with the installation with it. I’ll just follow the simple steps. Accept the license agreement. I already have SQL Express installed on my laptop, so I’m just going to go ahead and use my existing database instance of SQL Express. If I wanted to, I could quite create a new instance, which I won’t do for the moment. I can choose Windows authenticate or SQL Server authentication. I’m part of the domain, so I’m going to choose Windows authentication. Click “next.” It’s going to ask me whether I want to connect to an existing database or to a new one. Because I’m installing a brand new CRM, I have lots of test databases on here. I’m going to create a brand new CRM installation, punch in my license key. It’s asking me here which components I want to install. Generally speaking, all we really need to install is the communication service, which is used for sending emails, and the workflow service, which gives us not only the automated processing of our workflow rules, it’s what we use to integrate with MYOB, QuickBooks, and other accounting systems. The shared folder allows us to put documents on the server and have them managed by CRM. The files that we attach to the CRM can be stored in this folder. You can also have them stored in a Web storage or you can have them stored in the database which is the default. For the purposes of this demo, I’m just going to store them in the database. Now, it’s asking us for my username and password. [00:02:00] I’m not going to tell you what my password is. Now, we’ve got the optional Web modules. The Web marketing module lets us work with Web forms, clickstream. The Web Access module is a Web-based version of CRM. The Web Storage module lets us access files across the Internet if we’re running CRM in a replicated environment. Okay. Great. The CRM is installed, so, now, let’s run it. The default username for CRM is “admin.” We can see it set up a connection to my database that I’ve just installed. I’ll go ahead and log in. What we’re starting with here is a blank CRM. There’s nothing in here. This is just as it comes out of the box. There are no companies. There are no contacts. In my selling module, I have no products aside from just a default [freight 00:02:53] product. No quotes. No invoices. This is how most CRMs start. They’re completely empty of data, and then you have the challenge to go and get them useful and get some data in there, so what we’ll do is we’ll go to our accounting tab. You can see here we support several accounting systems. Empower, EXO, Infusion, MYOB, QuickBooks and Xero. I already have MYOB installed on my computer. What I’m going to do is I don’t have Enterprise installed. I have Premier installed. I happen to know where the Premier MYOB data files are, so I just need to tell the CRM where they are. I can check whether or not I have these settings correct by pressing “Test Connection.” I have. Great. The nature of the connection with MYOB is very, very deep. We can pull in not only companies and contacts as simple list, but we can pull in all of the products, customer pricing levels, different [00:04:00] locations in MYOB if you’re using a multi-location capable version. We pull things like tax codes, the general ledger, really everything that we need in order to create a sale, generate an invoice and a payment and even push that back across into MYOB. I’ve made it to default MYOB. I’ll call it Clearwater, and I’ll hit “Test Connection.” That’s all working. Save and close. Now, when I hit the “All” button, I’m going to pull in all of the data from MYOB into CRM. I’ll click the “All” button. We have a little notification down in the bottom right-hand side of the screen just showing that the workflow has started. If I wanted to now, I could go ahead and close the CRM. That’s going to work in the background. In a real environment, that would be working on the server. On my laptop [inaudible 00:04:58], just for the purposes of the demonstration, it’s all installed in 1 place. If I go ahead now and look over here, I can see we’re starting to get some data in. We’re getting companies in here. We’re getting contacts in here. Pretty soon, we’re going to have all things like the tax codes, the list of products, any invoices, purchase orders. Pretty much everything that you would use from a sales perspective inside MYOB, you’re going to find that we’ve pulled into the CRM. The reason why we do that is because we believe that the accounting system is really for compliances. All of your up-front leads, your opportunities, the whole sales pipeline, the whole sales process is all managed inside CRM. You don’t create a new customer in your accounting system the first time you hear about them. You create a lead a lead in CRM. Hopefully, they’ll become a customer. Then, you create an account in the accounting system. We make that very, very easy. We can do that just with a few clicks. We can see now that everything is all completed successfully. It’s all imported from MYOB, so let’s have a [00:06:00] look at what we got. We got companies. We got contacts. In the selling module, we have the list of products. Again, these are all just products from the MYOB system. Here is one of their sample products. We’ve pulled in as much detail from MYOB as we possibly can, even the supplier details, discounts that come in. The CRM has much more powerful discounting functions than most of the accounting systems, so, once import the discounts from the accounting system, that starts as a basic level of discount and we can then do an awful lot more with the Insight CRM. Across here, we can see the [GL 00:06:39] codes for the product. We need to have these pulled in if we’re going to be buying and selling and we want to transfer those details back across to MYOB. Down here, we can see the accounting system is MYOB, the accounting system data file is Clearwater, the last time we imported or exported, and the code in the accounting system. If I’d updated this record and I decided I need that to go back to MYOB, I can hit “To Accounting” button. It’ll start the process. We see the notification down here. When that’s completed, we get an alert. If I refresh that grid, we now see the last export date. We see how quick it is to get that across into the accounting system. Moving through here, I can have a look at sales orders. I can see invoices. I can see payments, even refunds and credit notes. If I go now to a company, for example, and I look at one of them, let’s say Footloose Dance Studio. It’s a customer that’s in MYOB. Straight away, I can see all of the detail. I can see the contact from MYOB. The difference is that we can have as many contacts in here as we like so we don’t have to reuse or abuse the fields that are in MYOB. I can look in the selling module, and I can see right away we have [00:08:00] 15 invoices. On the sales orders, I see some sales summary data, sales orders that have been created. There are no quotes. 15 invoices, 26 transactions, these are the items that we sold and when we’ve sold them and at what price. Again, like we had on product over here, I can see things like the credit terms, the account balance and so on. All of this has come from MYOB. Again, we see the last export date here as well. If I updated Footloose Dance Studio, for example, I changed the name to Footloose Dance Studios and I wanted that to go across to MYOB, I can just hit the “To Accounting” button. Again, we get a note down at the bottom saying that the process has started. That would continue whether or not I keep CRM open. There we are. The data has gone across. Let’s put this into practice. Let’s say we’ve just heard from a company. At the moment, they’re a lead. We’re going to create New Lead. Let’s just call it “New Lead Design.” They’re a lead. I can put in some detail. I can pop in a Website and I can add as many contacts as I like. I’ll add a contact to the company, and save and close. What it’s asking me now is, because I’ve put “New Lead Design” as the email address, it’s asking do I want to associate that with this company. I’m going to go ahead and say yes. [00:10:00] Now, anywhere in CRM that I create a contact with Newleaddesign.au, that’s just going to automatically link it with New Lead Design, the company that I’ve just created. I could add another contact, and save, close. Now, I’ve got 1 company, 2 contacts. They’re a lead. No reasons to put them to the accounting system just at this moment because they’re just a lead. There’s no financial transaction at all. I’m going to go ahead an make a quote. “Products.” “Add Quote.” I can choose who to send the quote to. I’ll pick [inaudible 00:10:48] sales and go ahead and add some items. There’s 2 ways I can add item. The way that we’re familiar with is the [inaudible 00:10:54]. I can pop in the items here, cooler kit or filter, large. I’ll have 2 of those. Let’s say filter kit number 1, large. We’ll have 1 of those. The other way I can do it is by clicking “Add Item.” “Add Item” brings me up a detail view. It shows me how many order, what my sale price is, what my cost price is when I pick the product. We can see margins. We can see stock availability, sales history, all of the different pricing levels as well. I won’t bother with doing that just for now, so I won’t save those changes. I can save that. Now, when we look at the customer, we can see a quote. I can open up the quote. I can preview the quote. There’s a built-in report design there so you can design there so you can change how the quote looks. I can save it as a PDF if I wish, I can print the quote, but important one is to send it. There’s an built-in email editor. [00:12:00] You can template it all up however you like. This is just how it comes out of the box. You put your design in here and, essentially, hit the “Send” button. That quote is now gone. I can look at the quote here and I can see it’s sitting there on my outbox. It’ll very shortly be gone. I have a record of sending the quote as well, which is quite important. When the customer comes back to us, we want to convert the quote to sales order. I can open the quote again, hit “Create Sales Order,” and it’s on my screen. Now, I can modify the sales order. The sales order can be different to the quote. I could say I have one of those or two of those. Again, I can preview it, see the detail. It looks like this item is on [back 00:12:47] order, so I’m going to delete that. I’m go ahead and generate my invoice. I approve the invoice, which takes it out of draft mode. Now, I can send that to the accounting system. Now, what that’s doing in the background is it’s first all determining whether a company called New Lead Design exists. If it doesn’t exist, it’s going to go and create it. The next thing it’s going to do is look to see whether this invoice exists. If that doesn’t exist, it’s going to go and create it. It’s going to do the same thing for every product on the invoice. Now, what we can see is there’s an invoice, there’s a code in the accounting system, and we can see it was exported, that’s when it’s gone across. If I were now to go back to the company, I can look at the “Accounts” tab, and I can see that’s been automatically created. Very, very easy. If I go back again and have a look at Footloose Dance Studios, we pulled in a lot of information from MYOB. One of the things that we can see here [inaudible 00:13:55], invoices over the last 12 months, sales, [00:14:00] products that they’ve purchased. Straight away, we can start to make use of some of these data. See full transcript below. Please note that the transcript is not 100% perfect and will contain errors of spelling and grammar and just incorrect heard words. One other feature of the grids, which is quite nice, is the conditional formatting feature. This is similar to the feature Microsoft Excel where you can have formatting in the grid depending on the values of the fields. For example, if you wanted to find somebody with an overdue balance or an outstanding balance, you could highlight them red. You could take something, for example, like a supplier or a customer and highlight it green. Let’s have a little look. If I go into my layout here, I can turn on conditional formatting. I can pick a field. For example, let’s say assign to equals Peter Parker. What we’ll do is we’ll make those rows red text and bold and click okay and click okay. Now we can see down here anything that’s assigned to Peter is bright red. That’s a really simple example of conditional formatting in our grids. We can use that quite extensively for things like overdue invoices, exceeded account balances, really anything that you want to draw attention to. By default, we have overdue tasks. It’s all configurable. Every element of the system is completely configurable in that regard. This entry was posted in Video on October 4, 2013 by admin. A Demo unlike any other. You are buying our expertise, not just our software. Our demo’s will give you the best chance of understanding what the software can do, but, it will also give you a chance to talk to one of our business automation experts. They have a wealth of experience working with hundreds of businesses in Australia. So, even if you don’t buy, we are sure you’ll get a lot out of the demo session.